Great wine is made first in the vineyard, no stone is left unturned in growing the best possible fruit. Fraser Gallop aim to achieve elegance in their wines, wines that are interesting, complex, and layered – wines that keep you discovering. Through minimal intervention and the use of traditional techniques, as well as the latest technology, wines are created that show balance and finesse upon release, and have the structure and pedigree to thrive with careful cellaring. Terroir is enormously important at Fraser Gallop Estate. It relates everything you taste, smell and see in a wine to the influence of its geographic origin, topography, soils, and vineyard/canopy management. 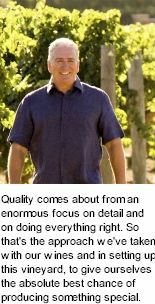 To produce the best quality wines means to take care of every detail and make quality decisions at the micro level. Decisions at the micro level which lead to a tremendous experience at the macro level. In essence, the attention to detail from planting through to bottling, is unsurpassable. Wilyabrup is a micro climate where cabernet in particular gives consistently great flavours. The selection of the property which would become Fraser Gallop Estate was undertaken between January and August 1998. Since first requirement was that the area produce outstanding cabernet, it was clear that the vineyard needed to be in the Wilyabrup region, home to producers like Moss Wood, Cullen, Pierro and Vasse Felix. The soils are rich, gravelly loams with clay sub-strata. These provide the attributes necessary for an un-irrigated vineyard. 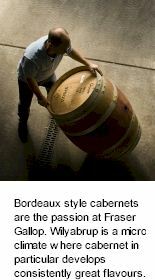 Since Bordeaux style cabernets are the passion at Fraser Gallop, 17 acres cabernet sauvignon, one acre merlot, one acre petit verdot, one acre cabernet franc and one acre malbec were planted. The area has also produced wonderful chardonnay, so 18 acres were planted. The clones are massively important, Houghton clone cabernet was selected along with Gin Gin chardonnay. Eight acres of semillon were planted in September 2007. The winemaking philosophy at Fraser Gallop Estate is essentially about wine quality. All vines are dry grown from planting, cane pruned, low yielding (three tonnes/acre reds, two tonnes per acre chardonnay), shoot thinned, leaf plucked, bunch thinned and hand picked. An intensive approach, but one that is reaping rewards. When the grapes are handed over to the winery, they are of a truly high standard. It is paramount that the fruit's qualities are showcased in the final glass. This means minimal handling of the grapes and treating the grapes with kid gloves. This includes hand picking, gravity feeding the press and minimal pumping of the wine. The winery building was completed in time for vintage 2008. With extensive planning and good equipment research and selection, one of the best equipped small winery facilities in WA is at the heart of Fraser Gallop. It is a joy for the winemaking team to work in and very efficient! With a capacity for 300 tonne of fruit, a small amount of quality-focused contract wine can also be made at the facility. The main aim for all wines made at Fraser Gallop is to preserve the fruit flavours in the grape as much as possible.